Regular readers and those who follow me on twitter have seen me talking a lot about my new hobby: spending time online logged in to telnet Bulletin Board Systems or BBSs around the net. Here on the blog I recently posted about BBSing from the Amiga 1000 via Raspberry Pi, using the WiFi232 device to get many different systems in my collect logged on, and clever tricks programmers used way back when to get around hardware limitations and enhance the BBS experience. Of the BBSs I frequent, one of my favorites is Level 29. It recently underwent a notable change when SysOp Chris Osborn (@FozzTexx) transitioned the board from the off-the-shelf BBS software he was running to a system he has written from scratch in an effort to make it more compatible with vintage systems featuring meager character display capabilities and 40-column text modes — or sometimes even less, such as the VIC-20 (22 characters by 23 lines), the ZX-80 (32 by 24), and certain vintage mobiles. One of the features of the BBS software he’s written is a system that detects the dimensions and terminal display protocol of the caller’s system (failing that, the user can enter the info manually). It’s a great feature that has made “dialing” in with my PocketChip a snap! The Epson PX-8 is a most unique laptop computer; it runs not DOS but CP/M 2.2 — and entirely from ROM. 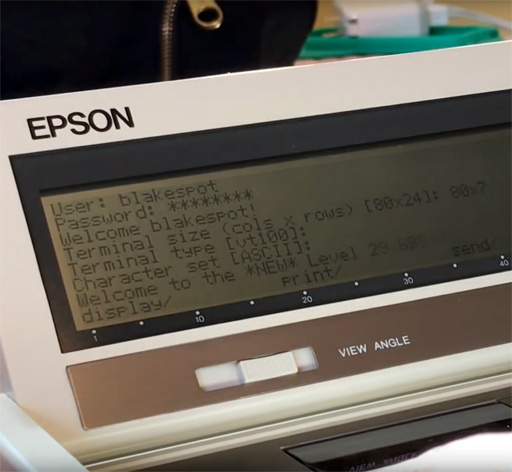 The unit features an 80 character by 8 line non-backlit LCD display and lacks internal disk storage, relying upon swappable ROM (DIP) chips accessible through a hatch on the underside of the unit for program loading. The PX-8 also sports a micro cassette tape drive for loading and saving user data. I wrote a piece about the system that goes into more detail a decade ago, shortly after acquiring it new-in-box, when I wired it up as a serial terminal for my Mac mini. (I might have a bit of a “serial terminal problem,” admittedly.) And here’s a review of the system I scanned from the September 1984 edition of Computer & Electronics magazine I have on the shelf. To get the PX-8 online, I dove into the three crates of cables I’ve accumulated over the past 35 years and found the cable parts I spliced ten years ago to get it attached to the Mac mini. Sadly the parts were separated, half having been repurposed and resoldered to get a TRS-80 Model 4 connected to my old Mac Pro. At any rate, I rebuilt the serial cable and attached the PX-8 to the USB-to-serial adapter hanging off of my Raspberry Pi 2 in order to get the PX-8 acting as a serial terminal so that it could jump via WiFi to Level 29. And it did so just fine and, indeed, provided a lovely BBS experience. I look rather forward to using the Epson PX-8 for more good times online! Anyone wanting to checkout the growing world of telnet BBSs should have a look at the Telnet BBS Guide as well as the excellent SyncTerm terminal app supporting most of the character sets and emulations you might encounter online. SyncTerm is free and available for a large number of platforms including Windows, macOS, Linux, Solaris, and Haiku. This entry was posted in BBS, Other Platform, Serial Terminal and tagged BBS, Digital Research, laptop, mobile, Z-80, Zilog. Bookmark the permalink. Oh man, I’m gonna have to check this out using my VIC-20 and my USR-TCP232-T2 for connectivity. Nice writeup! I owned one of these! I never really figured out how to use it besides simple basic programs, my uncle gave it to me, never found out where he got it from.